The slots that have come online lately all seem to have many paylines and several ways for the player to win big by playing or catching one of the bonus payouts. These slots are the newest evolution in the growth of the slot area of gaming. The era of one-armed bandits has come and gone with online slots developing more bonus features every time a new game comes out for play. Microgaming slots are the leading edge in this slot parade. Many of the newest games have layers of bonuses housed within one slot game. 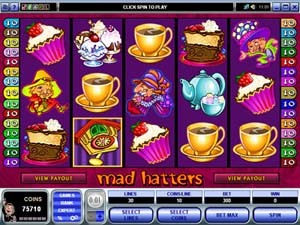 Mad Hatters is themed around the Alice in Wonderland Story with many of the characters of this famous story. A coin value on this slot game can be selected by the player and set at one cent to 50 cents. The jackpot comes in at a hefty 20,000 coins. The maximum wager per spin is 300 coins. This payline of 30 lines gives the player many chances to win on a given spin. 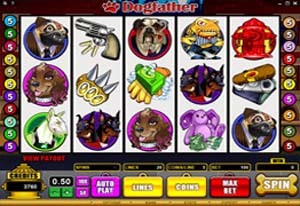 Dog Father is a 5-reel 20-payline video slot that has a jackpot of 13,000 coins. The selected coin value can range from one cent to 50 cents. This slot game is made for dog lovers. The images are all dog related including fire hydrants and fleas. The theme is about mafia dogs located in the Doggie underworld. Hydrants in psychedelic color trigger the bonus game. Mermaid Millions brings many features to the slot game including free spins, wilds, scatters and bonuses. The selected coin size ranges from one cent to $1. The top jackpot is 37,500 Coins. The theme of the sea and mermaids makes for great graphics with vivid colors. This world shows up in the images like sea horses, mermaids and a sunken treasure. This well illustrated slot game is visually pleasing as well as a possible source of a big gaming win.